What made you choose a Health or Social Care path? Having always been interested in health care, specifically in the pre-hospital environment, it was a natural progression to develop into a senior Health Care Professional in the pre-hospital environment. Having worked up from first aid level to becoming an ambulance clinician, becoming a Paramedic was the next big step in the pathway to pre-hospital care. With Paramedic courses being labelled as very competitive, I did a great deal or research and attended many open days to decide which was best to focus my attention. I chose Oxford Brookes due to its exceptional reputation, welcoming staff and based on the reviews I had heard from previous graduates. In addition, the collaboration with South Central Ambulance Service was very attractive, with it being one of the most forward thinking ambulance trusts in the UK. What were the best parts of your student experience at Brookes? The best part of the experience at Oxford Brookes was the great mix between clinical practice hours and university time. The program was structured very well and allowed for seamless transition from lecture-based education, to preparing you for ‘doing it for real’ during placements. In addition the placement supervisors were all fantastic and it was a pleasure to work with them. How much support did you get from the teaching team and the wider university? The support from the entire faculty of Health and Life Sciences, the staff at South Central Ambulance Service and the placement mentors was exceptional. Every department within the University and those collaborating with it shared the same, positive ethos. Having a strong and approachable team made placements much nicer and the whole experience very positive – especially in an environment which is high-pressure and often challenging. What aspects of your course would you recommend? Any advice you would give to others? I would confidently recommend every aspect of the course and have since recommended it to some now-students at Oxford Brookes. The best advice I could give to prospective students on the course would be to simply apply! - it can be hard to decide which university is for you, especially in respect of Paramedic education, but with the experience I have now, I would do the whole thing again at Oxford Brookes! What have you been doing since graduating from Oxford Brookes? What are your long term career plans? 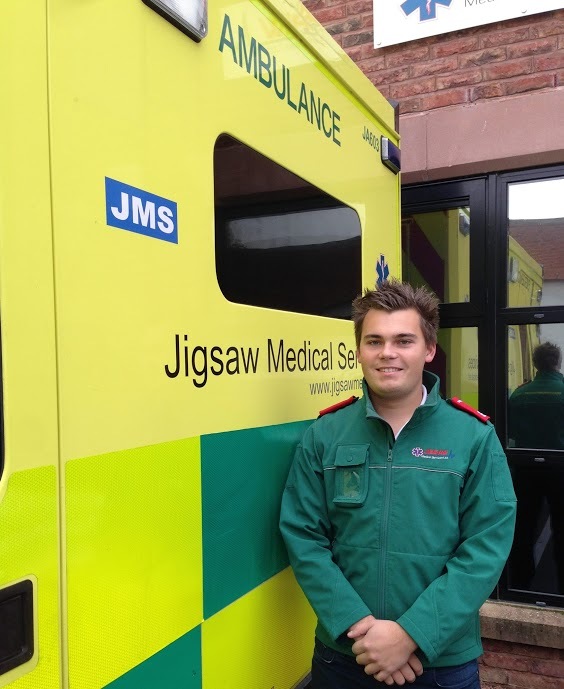 Since graduating, I have created my own business (Jigsaw Medical) which started as a hobby during my time at Oxford Brookes. I have utilised my clinical knowledge and skills to create a unique and clinically focused business. Jigsaw Medical is split between three divisions, operating in multiple offices throughout the North of England. Our divisions are made up of: Clinical Division – Providing event medicine, Ambulance services and medical repatriation services Training Division (through our acquisition of a training company in 2012, whilst I was still studying!) - which provides commercial clinical & first aid education. Recruitment Division – which provides temporary and permanent staffing solutions to NHS Hospitals, Ambulance Trusts and private clients. We have grown considerably over the past two years and have provided services to a number of high-profile clients including the NHS, Virgin and more recently the provision of over 200 Doctors, Nurses & Paramedics for the Yorkshire leg of the Tour de France. Additionally, the team and I at Jigsaw Medical were honoured to be awarded the Best Enterprise award in the Northern heats of the Lloyds Enterprise Awards in September 2014. In addition to running the business, I continue to work clinically – responding for my local NHS ambulance service, working on Jigsaw Medical Ambulances, and I am additionally studying an MsC in Critical Care, part-time with Cardiff Medical School, something my education from Oxford Brookes put me in great stead for.